Blowing clean sports fields, parking places, roads and paths. This machine, with its enormous power and a far-reaching airflow, is ideally suited for large terrains such as sports fields. The reverse exhaust spout can be adjusted hydraulically from the driver’s seat, something that makes its operation very easy. When changing direction of travel and driving back again, you can still blow in the same direction using the reverse exhaust spout. You can blow to the left and right of the machine, and you can blow on both sides in one pass while blowing clean your paths and roads in one go if you set the exhaust spout at half-height. 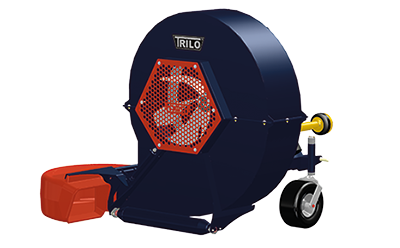 The large gauge wheels and anti-scalp roller ensure that the leaf blower perfectly follows the ground contours and this protects both the exhaust spout and the turf. The fan is driven by a PTO drive shaft attached to the tractor and requires an output of 50 HP (37 kW). • The most powerful leaf blower on the market. • Reverse exhaust spout is hydraulically operated from the driver’s seat.